Camp Odayin provides life changing camp experiences to children with heart disease and their families. Participants pay just $25 to attend Residential Camp, Winter Camp, Day Camp, Family Camp, or the Moms Retreat. Residential Camp allows campers in grades 1-11 to enjoy swimming, boating, arts and crafts, volleyball, horseback riding, nature, basketball, and music in a safe, medically-supervised environment during a five day experience. 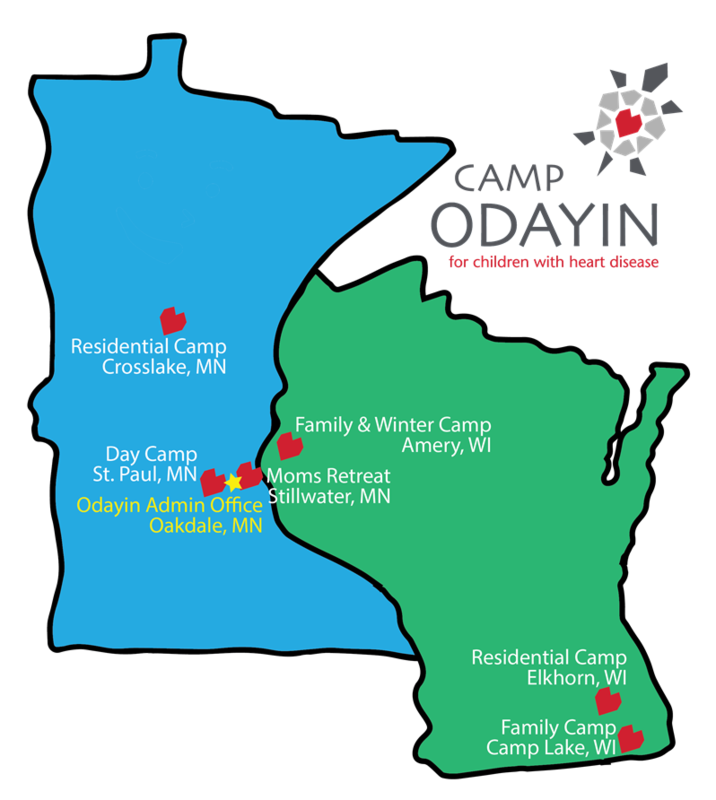 Camp Odayin hosts Residential Camp in two locations. There are three weeks in July at Camp Knutson in Crosslake, MN and one week in August at Camp Lutherdale in Elkhorn, WI. Campers may attend only one summer camp session. Day Camp allows campers in grades K-3 to experience arts & crafts, nature, and new friends while receiving an introduction to our mission during this five day program. Campers enjoy environmental education and interaction with a variety of animals at the Dodge Nature Center in St. Paul, MN. Family Camp is an opportunity for families with a child with heart disease age birth to 12th grade to come together for fun, education, support and camaraderie. There are two Friday to Sunday sessions hosted in the Midwest. Family Camp is hosted near Minneapolis at Camp Wapogasset in Amery, WI and near Milwaukee at Wonderland Camp in Camp Lake, WI. Winter Camp offers Residential Camp or Day Camp campers who attended the previous summer the chance to reconnect and experience snowshoeing, broomball, and sledding over a three day weekend at Camp Wapogasset in Amery, WI. The Moms Retreat is a time for moms of young people with heart disease to connect for support, education and empowerment. The Saturday to Sunday retreat includes meals, lodging, optional spa and yoga activities, and fabulous guest speakers at the Water Street Inn in Stillwater, MN. Camp Odayin serves all people regardless of race, color, creed, religion, national origin, gender identity and expression, sexual orientation, or socioeconomic status.